ELGIN — A new season means new opportunities for players to shine. That’s what the Elgin Public/Pope John football team is hoping for as they head into 2017. For Coach Randy Eisenhauer, his assistant coaches and players, they’re hoping last season’s misfortunes don’t happen again this year. One year ago the Wolfpack went winless, in large part due to injuries and inexperience. During an interview in the coach’s office, Eisenhauer said injuries in the first two games took away five of the team’s top eight players. The team never really recovered from that point as foes took advantage of the Wolfpack’s young, inexperienced team. In a way, it seemed like the Wolfpack had a “black cloud” hanging over them the entire season. Enough about last year. This year’s team has experience where it didn’t last year. If the team can avoid injuries which put players on the sidelines, they will be better equipped to face a challenging schedule. 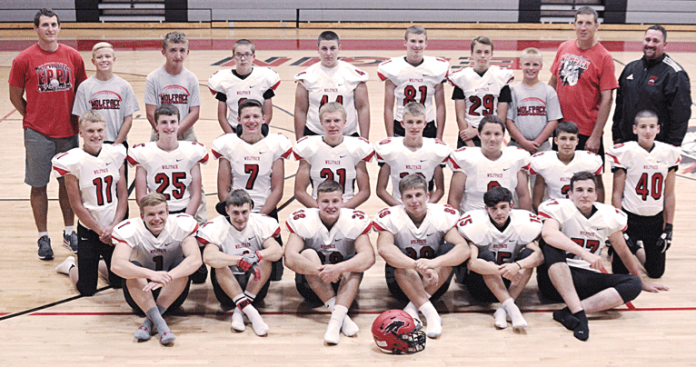 The Wolfpack open Friday night on the road at Burwell who won the D-1 state championship last year and, according to some pundits, are a good bet to repeat. Down the road, the Wolfpack will face Howells, Chambers/Wheeler Central/Ewing (both considered among D-1’s best teams) and Neligh/Oakdale. The Wolfpack’s best player may be junior Hunter Reestman. When healthy, he’s a strong tailback on offense and a hard-hitting tackler on defense. Last year he gained 222 yards on 69 carries. He’s the top returning rusher. The Wolfpack will have experience at quarterback. Sophomore Conor Ramold took most of the snaps last season as a freshman. Ramold, behind a shaky offensive line last year, completed 29 of 67 passes for 260 yards. Ramold enters the season bigger and stronger thanks to work in the weight room over the summer. “He gained experience under fire. I told him ‘you’re in charge’ as quarterback,” Eisenhauer said. Together, they’ll provide the Wolfpack with some firepower on offense. An outside threat for the Wolfpack will be junior Kyle Schumacher. Last season Schumacher averaged 25.5 yards per catch. He offers a target for Ramold to throw to. He also could see action as a running back, depending on how Coach Eisenhauer chooses to use him. Playing the other end position will be sophomore Adam Dreger. “Our offense this year will be trying to get players into open spaces where they can make the first tackler miss,” Eisenhauer said. The Wolfpack’s best offensive lineman, guard Liam Heithoff, will anchor the line when he returns from injury. When healthy, EPPJ will have Heithoff and Carter Schindler at the guard positions and Hayes Miller at center. Heithoff, a senior, has started for the Wolfpack going back to his freshman season. Providing depth in the offensive line will be junior Ervin Dohmen. Lane Bartak offers the Wolfpack some size, but he’s still on crutches and when he is able to play remains a question mark entering the season. Heithoff was the team’s leading tackler last season, averaging just over 13 tackles per game. He set a Wolfpack season record with 52 solo tackles. Much of last year’s top defensive players return, giving the Wolfpack valuable experience on that side of the ball. Reestman led the Wolfpack with three fumble recoveries last season and tied for the team high in interceptions with one, along with Cameron Nielsen. On defense, he said the Wolfpack need to limit the number of big plays opponents have this season. That was a problem last year as opponents used the big play to put the Wolfpack behind early. Assistant Coach Michael Becker will coach the defense while new Assistant Coach Scott Becker will split special team duties with Coach Eisenhauer. As most head coaches do, Eisenhauer will coach the offense. Eisenhauer said the team is working on staying positive. Football is a game of cycles. The Wolfpack had a tremendous run during the past few years, highlighted by back-to-back undefeated state champion teams. Those years are behind the team and the seniors on the team are the last players who were on the squad when the team made its last big run in the playoffs. He said the mindset of the team must be that they’re not going to accept going winless and that they’re going to work harder. A commitment to working in the weight room is a must to be successful. He said six players on the team made it to 40 days or more in the weight room. In most games this season, the Wolfpack will face obstacles in terms of size. “Most of our players are under 150 pounds than over 180,” Eisenhauer said. Carter Schindler is the biggest player on the Wolfpack squad at 230 pounds. Seventeen boys are out for football this year. That number includes two foreign exchange students who have never played American football before. “The kids are working hard every day, they’re getting better every day,” he said.